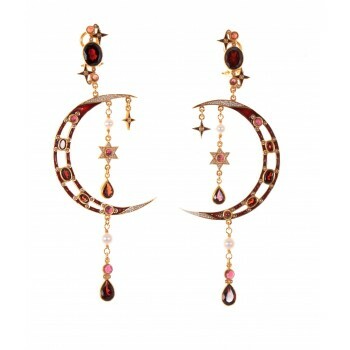 Earrings in gold plated silver 925/1000 with 18 kt pin. Earrings with ruby, onyx and micromosaic of seedpearls. Earrings with white topaz and onyx. Earrings with onyx, ruby and micromosaic of seedpearls. Earrings with onyx and white topaz. Earrings with onyx, green agate and micromosaic of seedpearls. Earrings with amethyst and green agate. Cross with amethyst and pearls. Earrings with blue topaz, tourmaline and green zircon. Earrings with amethyst and orange zircon. Earrings with citrine, sapphire and pearl. Earrings with moonstone, iolite and hematite. Dragonfly earrings with garnet and sapphire. Cufflinks with ruby and micromosaic of seedpearls. Cufflinks with lapis lazuli and moonstone. Cufflinks with garnet and sapphire. Cufflinks with amber and sapphire. Earrings with sapphire and emerald. Earrings with onyx, garnet and pearls. Earrings with blue topaz, ruby and pearls. Earrings with blue topaz, ruby, kyanite and micromosaic of seedpearls. Earrings with moonstone and pearl. Earrings with peridot, rose zircon and rose quartz.